In its pursuit to paint the Philippines happy and healthy, one colorful fun run at a time, Color Manila Event Inc., the prime organizer of colorful fun runs in the Philippines, heads towards the “Queen City of the South”, Cebu City, this September 16, 2017 for CM Blacklight Cebu 2017, another edition of #CMBlacklightTour, Color Manila’s colorful night run city tour. 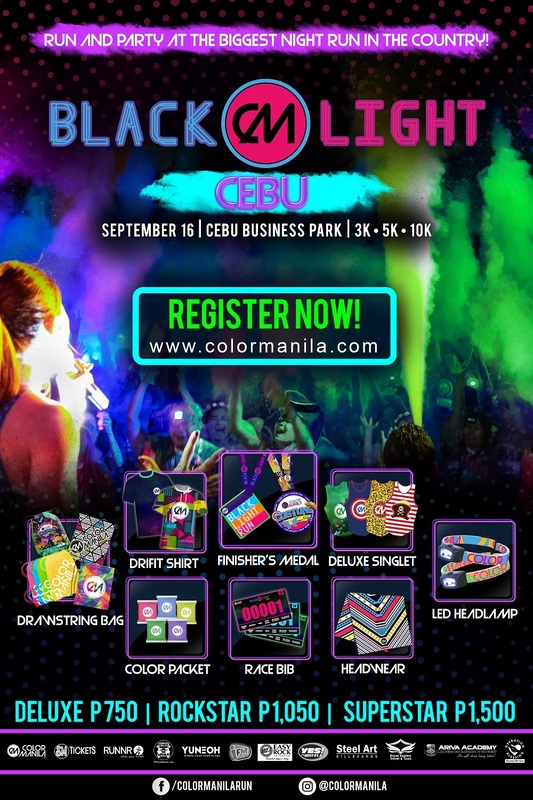 Whether you’re a seasoned runner who wants to take a breather from timed races, or a certified selfie junkie who just wants to collect colorful and social media-worthy photos while running, CM Blacklight Cebu promises participants of all shapes and stripes a feel-good and fun-filled running experience. 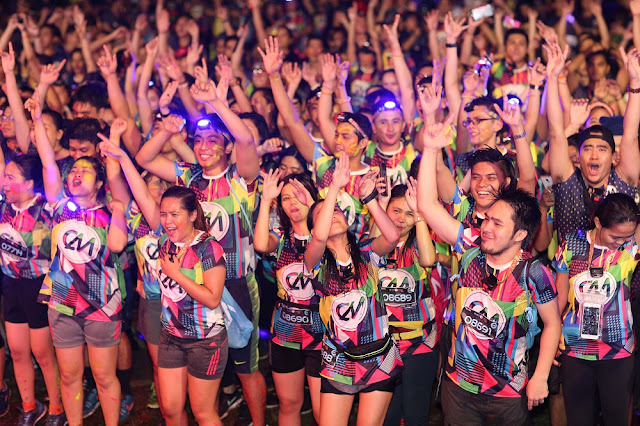 Together, runners will light up Cebu and lose themselves in a kaleidoscope of colors, brilliant lights, and bright smiles. 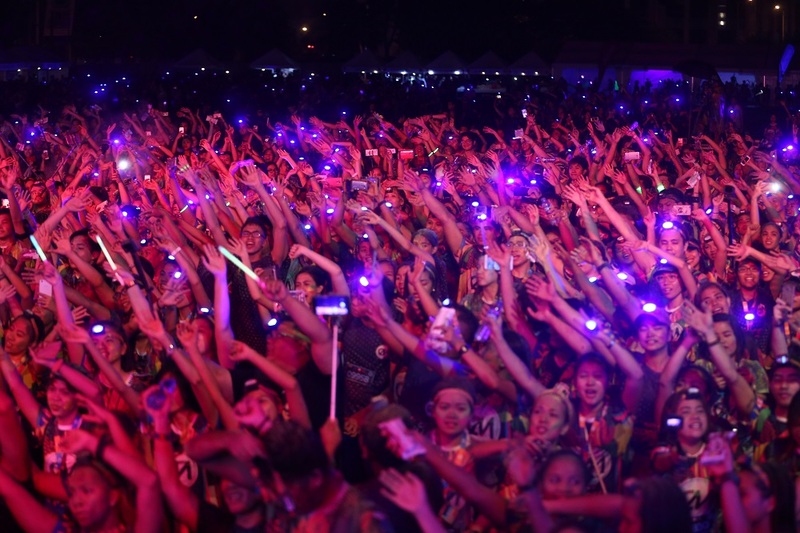 Their wide grins will be more difficult to remove than the color stains once they sprinkle themselves with neon-tinged powder while they swing to the sound of today’s music hits at the Color Festival. If it’s not on IG, it’s as if it didn’t happen! Laugh with your family and friends while on the go and create lasting memories by striking your most IG-worthy poses. “After garnering overwhelming response from our Manila, Bacolod, and Davao participants for this year’s #CMBlacklightTour, we are even more excited and energized to conquer more cities and leave trails of full-on fun and festivities to each, including Cebu, of course! Cebu is a historical city and we’re so pumped up to make history on its territory and create another colorful mark on its running scene!” relates Color Manila VP Justine Cordero. You will surely give others major outfit envy with these CM Blacklight Cebu race kits. Well, how can we blame them when our kits are as awesome as these, right?! 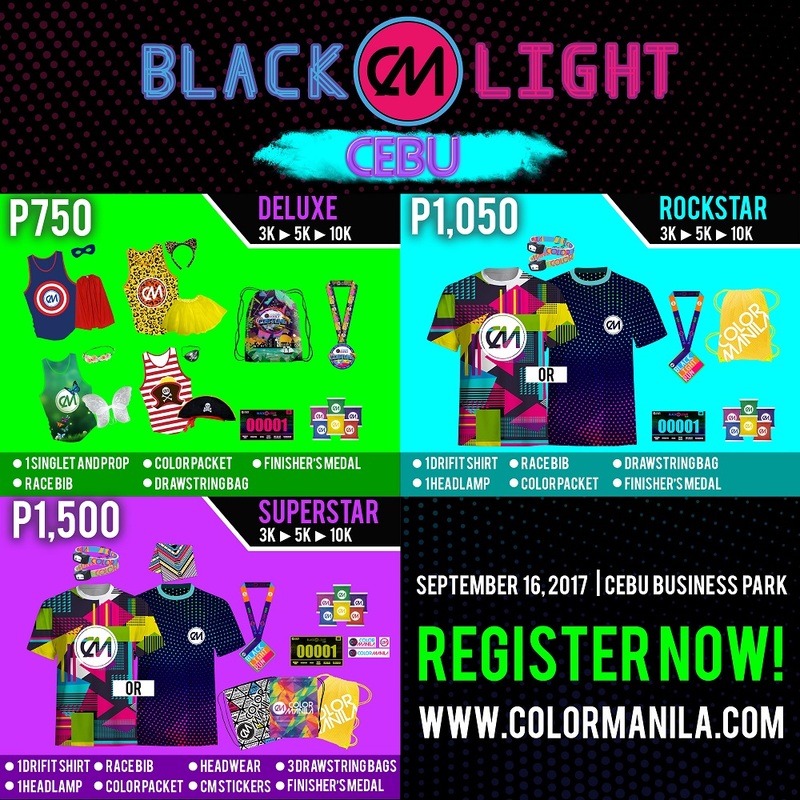 Participants of CM Blacklight Cebu 2017 may choose to cover non-timed 3K, 5K, or 10K distances, and may select from the Deluxe, Rockstar, and Superstar kits. The Deluxe kit can be purchased for Php 750 and includes a costume singlet, costume prop, race bib, costume drawstring bag, finisher’s medal, and a color packet. The Rockstar kit, on the other hand, only costs Php1,050 and contains a Dri-FIT shirt, race bib, headlamp, drawstring bag, color packet, and finisher’s medal, while the Superstar kit is up for grabs at Php1,500 and consists of a Dri-FIT shirt, race bib, headlamp, three drawstring bags, headwear, CM sticker, color packet, and finisher’s medal. 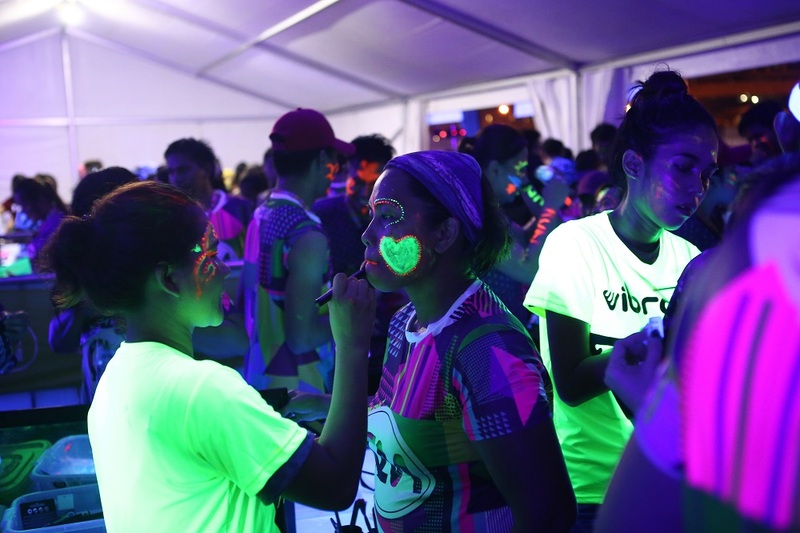 Happiness will definitely be written all over your face, quite literally, when you run with your face colored in glow-in-the-dark paints! Online registration via PayPal is ongoing up to September 15, 2017 or until supplies last at colormanila.com. Onsite registration is available in RUNNR Ayala Cebu from September 1-12. Interested participants may also purchase SM Tickets at any SM Cinema booth nationwide. For Cebuano registrants, you may purchase SM Tickets at the SM Cinema booth of SM City Cebu, SM City Consolacion, and SM Seaside Cebu. Make sure to register the SM Ticket code at colormanila.com. At CM Blacklight Cebu, everyone’s a winner as all participants get to take home these highly covetable medals! CM Blacklight Cebu is supported by SM Tickets, RUNNR Ayala Cebu, WhenInManila.com, YuneOh, iFM 93.9, Easy Rock Cebu, Yes FM, Steel Art, Nature's Spring, Arriva Academy, and Operation Blessing. 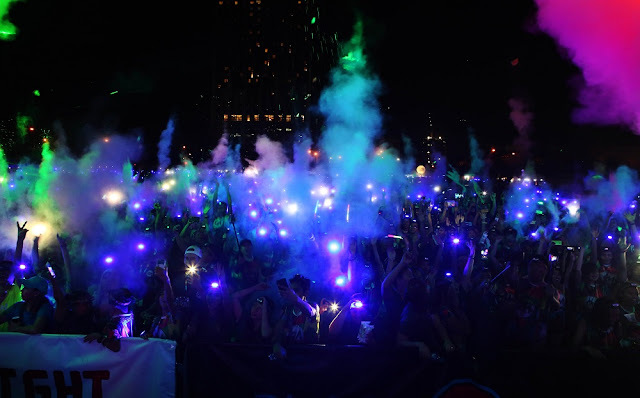 Put on your dancing shoes after the run because at the Color Festival, we will make you move and groove to the beat of today’s latest hits and party like there’s no tomorrow! 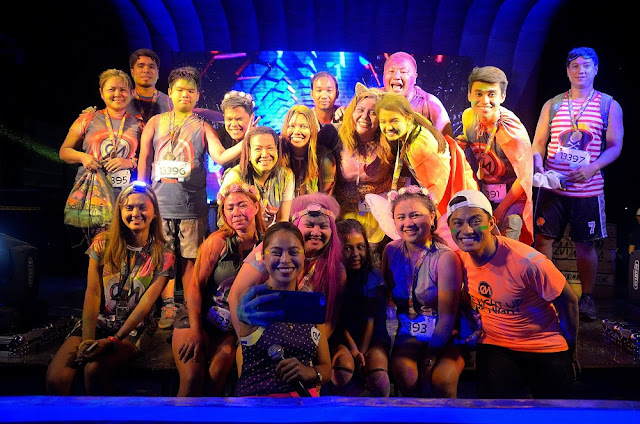 Color galore, company of friends and families, and captivating sounds and smiles—CM Blacklight Cebu is everything you ever wanted (and more!) captured in one noteworthy night run. Apil na! For more details on Color Manila events, visit www.colormanila.com! Let’s soak Cebu Business Park in vibrant, neon-colored powder and scream at the top of our lungs while swinging and swaying to the beat of today’s latest hits at the Color Festival! Like fireflies flying freely at night, let’s light up Cebu with our flashy headlamps, brightest beams, and glow-in-the-dark neon color bursts under the moonlit and star-studded skies!